(After several years of anticipation, and months of planning and preparation, I enter – for the first time in 39 years of ordained ministry – into a fourteen week period of study and refreshment known as a “Sabbatical”. Its central thrust is study and writing in 16th Century Anglican Reformation history, but it involves travel to Toronto, to our cottage in Québec, to England, to British Columbia, finally ending up back in Toronto. And so it begins. A final flurry of packing, hugs and tears with Heather, then setting out on the highway in my rust-bedecked fifteen year old car. As well, once I have loaded up with books, I’d like to go to the cottage to read them, and need a car for that! To be on the safe side (the Mazda is old, and has 265,000 kilometres on it) I had it overhauled – new coil spring on the rear, new ball joint on the front – and the mechanic assured me it could make the trip safely (while ominously suggesting this vehicle is truly at the end of its usable life). Once on the highway, and getting up to speed, I noticed something disquieting. There was a vibration in the back, as if a wheel were loose. I stopped, and tried to wiggle the wheels, but nothing seemed about to fall off. Bolts were tight. The noise persisted, however, and I decided I would stop and have it looked at when I got to the town of Dryden. What is missing in front of this motel? “A bearing is loose on the right rear wheel,” said the mechanic. “Do you think tightening it will do the trick?” I asked. I knew things weren’t going too well when I saw a growing number of mechanics gathering around my car and examining the right rear wheel. “Bad news, I’m afraid,” said the service advisor, “The spindle nut – it holds the wheel bearing in place – has completely stripped its threads. If we tried to put it back on and tighten it properly, it won’t hold, and sooner or later your wheel will fall off! I had just come from Winnipeg! To think that they were sending back to my home city to get a small $3 bolt – necessitating an unwanted motel stay for me, having not gone nearly far enough in my first day! But such is life. That nut could have let go at any point in my journey, so I’m just as glad to have it fixed; but where I planned a three-day journey with two nights in motels, I now almost certainly have an extra night thrust upon me. Ahh well. At least I have lots of time to start this web log! Can you imagine a motel with no telephone of any sort in the rooms? The one in which I am staying on the second night of my Sabbatical is so far from civilization that the only telephone on the property is a radio phone! Surely there is no part of the Trans Canada highway as uninhabited as it is here! Which really poses no problem – I talked to Heather by cellphone from Thunder Bay earlier in the day, and the internet can wait for a day or two! The “spindle nut” must have arrived in Dryden really early, because the repair shop phoned me by ten o’clock in the morning to say my car was ready. With great delight, I got back on the highway, only to find the noisy vibration had not really been cured. I tried to persuade myself that it was “better” than before, but it probably wasn’t. The only consolation for the unexpected early motel stop is the fact that those spindle nut threads really were stripped, and a genuine risk of losing a wheel at high speed is now probably greatly reduced. I covered about 800 kilometres today, and sitting in the car all day I learned interesting things about that shuddering wheel. It stops when driving on a sweeping right curve in the highway – when the weight of the car is lifted slightly from it through centrifugal force. As well, it is not noticeable at speeds below 95 kmh. It disappears entirely at speeds above 130 kmh (you will, of course, not ask how I might know this). When I was passing through Thunder Bay I had a long telephone chat with Mazda technicians, and I ended up believing that while the noise and the car’s vibration is annoying, it is not life-threatening. By the end of the day, I was no longer actively listening to it. Besides, the car was getting noisier for another reason: the muffler seems to be about to expire. At a couple of points along the highway traffic had to stop for construction workers. During one particularly long wait, I was able to write down some thoughts that were taking shape around my research project. The transition from parish priest to student has subtly begun. I didn’t particularly want to include King Henry VIII in the book I hope to write. Most of my life I have resisted the idea that the church which I love and serve was “founded” by a man who had more marriages than a screen celebrity, and who, when he wasn’t womanizing, was a murderous and capricious despot. Thomas Cranmer, I would say, though very much a flawed individual, had more influence on the shape and feel of the Anglican church than Henry. However, the truth is that the tumultuous events of the 16th Century – though they bear the marks of many wise (and many foolish) people – probably would not have taken anything like the direction they did if it were not for Henry. He can’t be left out of any book about the period. It is equally true that the Anglican Reformation wouldn’t have been a “reformation” at all were it not for a host of other people – and not only the obvious ones, the public figures of whom much has, and will, be written, but the ordinary folk, who left very little trace of their thoughts and feelings for the historian to observe. My book has to be about them, too! So I sit in my remote motel musing. And the Sabbatical is now underway. Did you know that it takes leather from 3,000 cattle to supply the NFL with footballs for just one season? I came across this mind-boggling news today, as I gulped down my orange juice at the “all-day breakfast” truck centre in Wawa, ON. ol’ Harry grumbles and roars, but does the job. I had slept in. A lot. By the time I got to Wawa it was not even “morning” any more, and I wasn’t sure if I had time to make it all the way to Toronto. It’s a huge trip from last night’s motel to Ariel’s door – about 1100 kilometres – but can be done in one session if you start early enough. Well, I started late, but here I am! I made it. 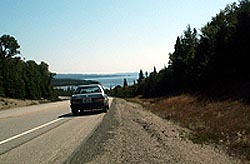 The journey took me through some of the most beautiful scenery in the world: the northeast shore of Lake Superor. The day was sunny and warm, and I was so relaxed in those first few hours of driving that I stopped several times just to take it all in. As well, my mind was positively churning with concepts for my book, so, what with the stunning surroundings and my “rich inner life,” the hours and the kilometres passed quickly by. 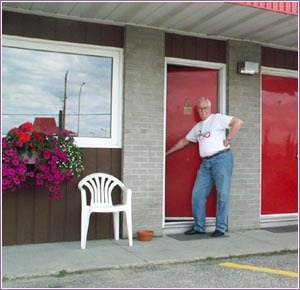 For a while I thought of stopping early and spending one more night in a motel, just to keep up the very relaxed mood, but a cellphone call with Heather changed all that. She later explained that she was just worried about me being on the road during a weekend, but in that phone conversation she outlined in very clear language not her worries but the many deficiencies of my thought processes! I am, after all, a male, and worse, a “husband,” and for three months I will be wandering about the world unsupervised by a female. Bad decisions are bound to be made. However, luckily this one was derailed in the nick of time. I stalled a bit, and said “I’ll try to get as far as Sudbury, and will see how I feel by then,” but, as I drove by that great mining city around 7:30 p.m. I did what was required and committed myself to complete the journey today, late start notwithstanding. As the decision to go the distance loomed, my need to cover a lot of ground increased, and my sense of relaxation decreased correspondingly. Speed would be good. Peace would not be part of it. There is a technique to fast highway driving: when you are passed by a very large vehicle, just fall in behind. The big guy acts as a “foil” for police radar, and the rusty little car can churn merrily along at speeds which would generate a hefty fine. Sometimes, in Southern Ontario where there is considerable traffic, you can get in with large convoys, all running together well above the posted limit. Clearly, the philosophy is that guardians of the law may take down the front runner, but they can’t possibly nab everybody at once! Well, ol’ Harry (I’ve given my car a name) didn’t exactly enjoy this high speed run. He did it, as it were, under protest. During a particularly vigorous acceleration, the muffler packed it in. It was already rumbling, but now the rumble turned into a growl, and the growl quickly turned into a roar, until, for hours on end, the car sounded like a WWII bomber on a night run over Europe with a full payload. It was so loud that – and this is a modest consolation – I couldn’t hear the noise from the juddering wheel any more. Mind you, I could still feel something vibrating madly down there – it had not gone away, and was sometimes extreme. Yes, it still stopped shaking over 130 kmh (blessed relief, but what if the wheel actually falls off as I am passing a tanker trailer!? ), and it would also go away at speeds under 90 kmh (funny, that’s the posted limit – was ol’ Harry in league with the authorities? ), but at least I didn’t have to listen to it any more. With this kind of driving, of course, all serenity is blown right out the window. Reflections upon arcane 16th Century issues, or upon cows that die for football, no longer floated freely in my head. Knuckles white, both hands gripping the steering, eyes grimly trying to pierce the onrushing night, I poured on the gas and the kilometers sped by. Finally, safe and sound at 11:40 p.m., I was visiting happily in their living room with Ariel and Shai! I phoned Heather, too, and let her know. She expressed considerable relief, even joy. The first stage of my Sabbatical – the journey East – is done. It is probably perverse of me, but I enjoy making old things work. So, as soon as I was up and dressed this morning, it was off to the muffler shop with ol’ Harry. In minutes he was up on a hoist, sparks flying as the worker cut off the rot and welded the new pieces into place. In the grip of my peculiar perversity, I asked him to look for anything broken that might be the cause of the juddering noise. Sure enough, a link was snapped off at the front – not the back, to be sure, where the noise and vibration seems to originate, but I had it fixed anyway. It didn’t cost much. A test run on highway 427 showed ol’ Harry to be quiet and responsive. True, the juddering could still be felt at certain high speeds, but it was much, much better! The rest of the day was spent settling into my room, typing up this web log, and spending the evening with family.